Valentine's Day is tomorrow, did you know? Eye rolls. One of the many perks of being a singleton running up to the day of looove is the vast number of times you can get away with buying yourself pretty make up as a present. I mean, it's not like I don't do this every week anyway... But I'll take any excuse thrown my way to splurge. 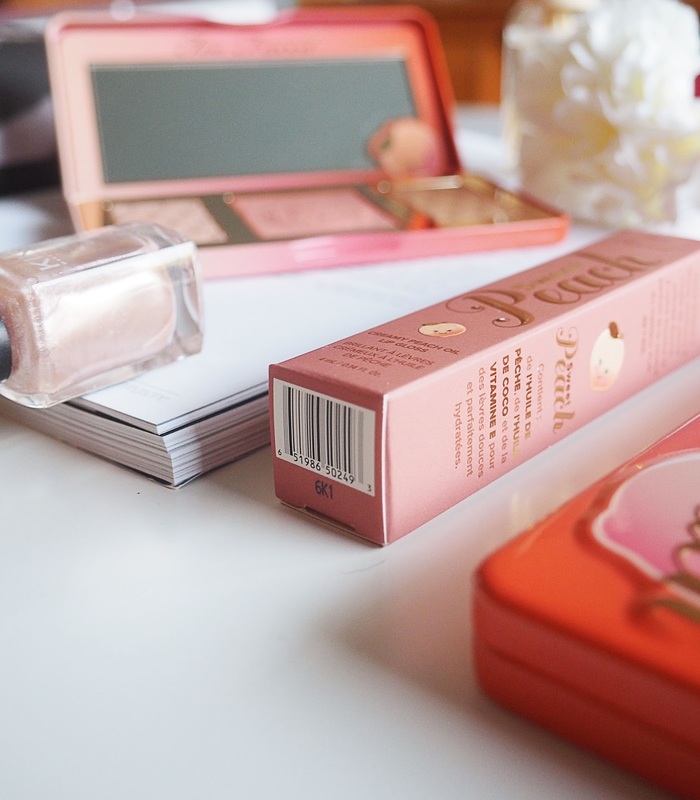 The Too Faced Sweet Peach collection is back. Permanently. Just in case you lived under a rock and are the only person to not be sucked in by all the peachy goodness. This time two months ago, I'd never even tried a Too Faced product, let alone own five of them. I've well and truly given into the hype, sue me. Jk, please don't sue me; I'm poor now. I'd bore you with the details of how excited I was to get them but basically, I saved up my hard earned dollar (pounds) and decided to damn well treat myself. 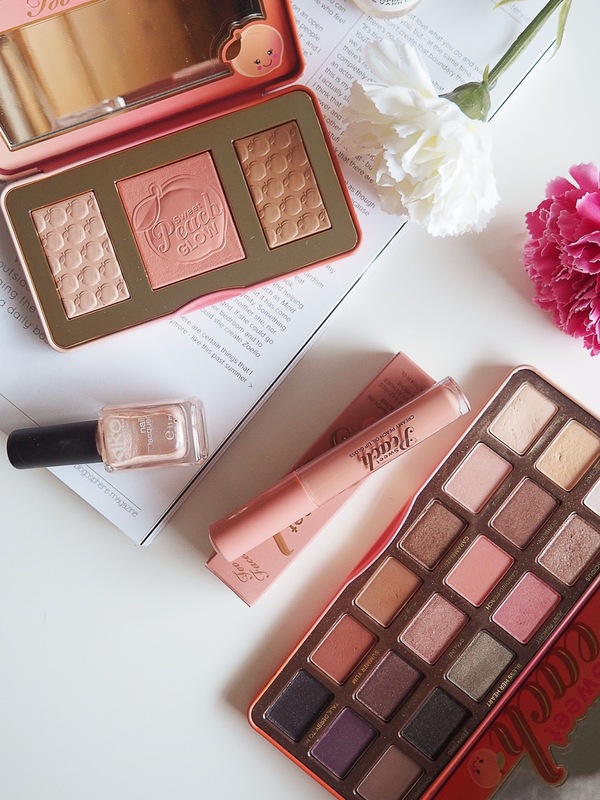 Considering I've been banging on about the Sweet Peach palette for the last year, I knew I just had to go all out. 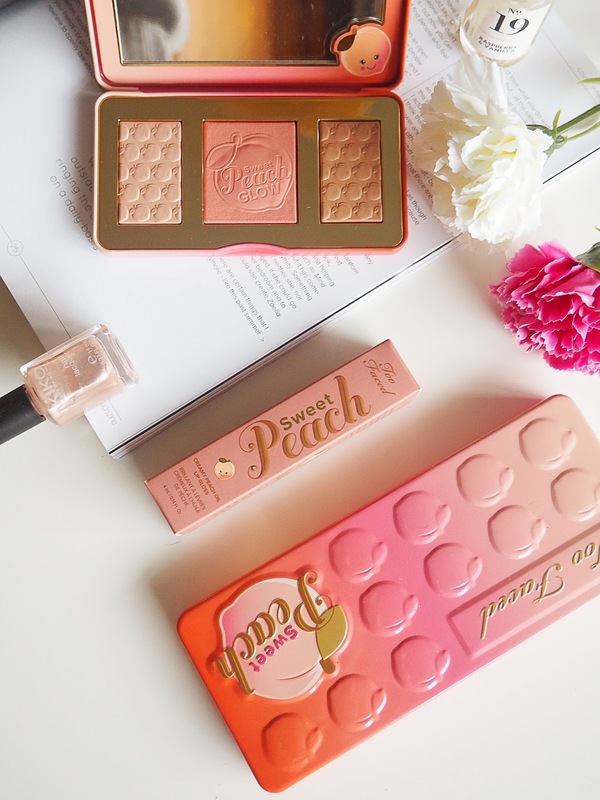 The lucky products and yet again, the newest additions to my make up collection are, the Sweet Peach palette (£39), the Sweet Peach Glow Kit (£34) and one of the Sweet Peach Creamy Lip Oils in Papa Don't Peach (£16). The glow kit has been described as a bit of a hit and miss product and whilst I believe it isn't worth the hefty price tag, it's just beautiful to look at. Whilst following the classic peach scent that the rest of the line features, it's also infused with peach essence. I don't know all the technicalities but it is the dreamiest little kit I've ever owned. If I'm being 100% honest, the pigmentation isn't there, which you'll be able to see later on. The highlighter is a buildable champagne colour with peach reflects, it truly is stunning. The blush is again, buildable, but so beautiful on its own. 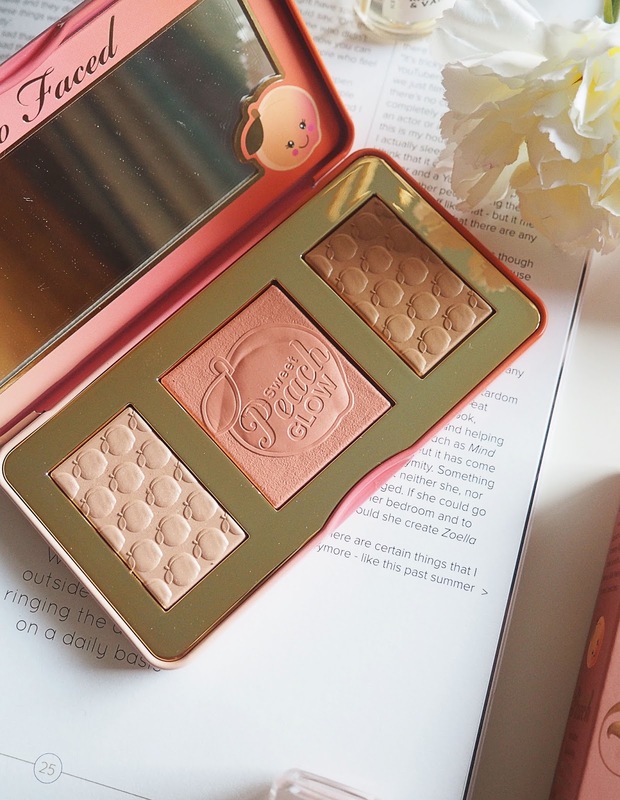 If you're like me and aren't about the blusher life, this is perfect as it adds a soft but subtle sheen to your cheeks. Not too harsh but still noticeable. The bronzer is by far my least favourite of this little palette, but that's only because I like a bronzer that I can contour with. Saying that, it's great to use with a fan brush for a soft, all over glow! One of the products that I was slightly dubious about was the lip oils. I'm a matte gal through and through and haven't worn a fully glossy lip in well over a year, but once I heard all the raving reviews, I immediately had high hopes! They're more pigmented than a lip gloss, but less sticky which is why I suppose they are classed as a lip oil. The texture is more of a thick lip balm due to the moisturising properties of the ingredients; peach oil, coconut oil and vitamin E.
The Sweet Peach palette just wins everything about this collection hands down. 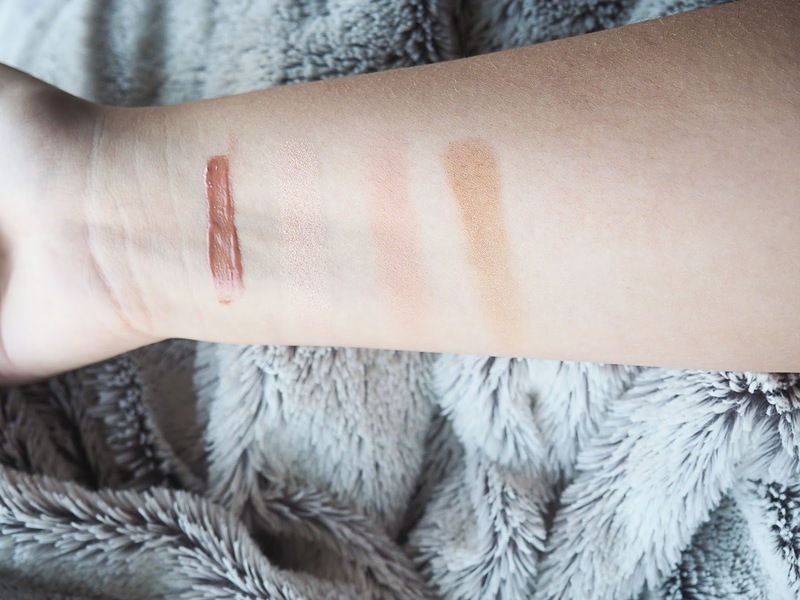 I haven't included swatches as I'm saving that for a later post (Google has plenty though! ), but in terms of quality, pigmentation and colour payoff; it's up there with the Naked palettes. 'Summer Yum' is by far my favourite shade in this beauty, closely followed by 'Peaches N Cream', 'Bellini' and 'Luscious'. I feel that the looks you can create are so varied. The possibilities are endless due to the deep purple tones and the miscellaneous khaki green that the palette has to offer. All I'm saying is, if you're not an eyeshadow person then get this on your wishlist. It's the ultimate game changer. Ahhh I really want the glow kit but I've heard it's not worth it so I've not splurged on it. You've actually made me want the lip oil (which is something I never thought I'd say), the colour is so nice and it not being sticky is definitely a bonus as that's my no1 hate!! I didn't splurge on any of the additional items but I got the Sweet Peach palette back in December and I LOVE it. It's so gorgeous and will be perfect for summertime looks! 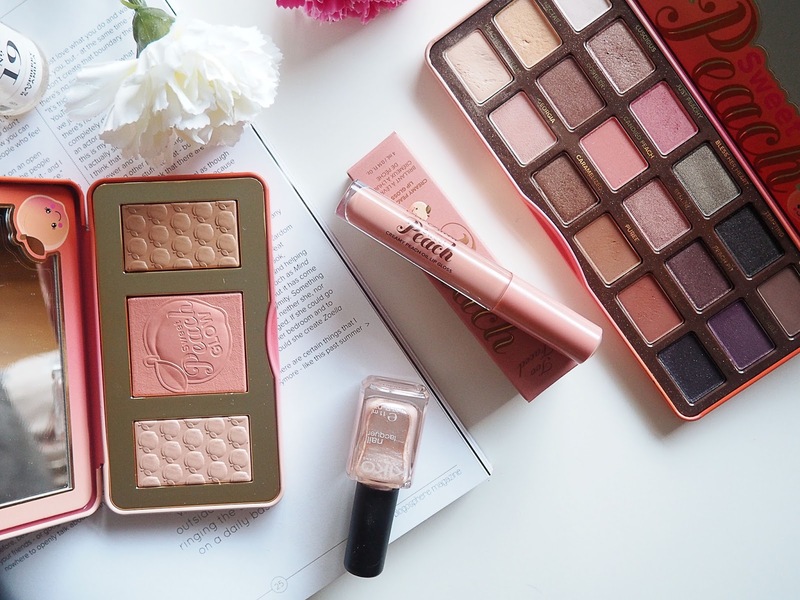 The whole too faced sweet peach collection is absolutely gorgeous - the palette especially!